For a 30-year mortgage that started less than a year ago, how much will the monthly payment be after making an additional $100,000 payment towards the principal? The mortgage currently has a balance of $295,000, and the monthly payment is $2400. My monthly payment is $2,380 exactly. What will be the monthly payment if I pay early large payment of $100,000? It will most likely be $2,380. This will depend on the specifics of your mortgage contract, but the monthly payment generally won't automatically change in this situation. If you're paying off such a substantial portion of the outstanding balance, you may want to look at refinancing the loan entirely to get a lower interest rate and/or lower monthly payment, although there will be additional costs associated with this. Final balance is zero, as required. The payment remains at $2400, as expected. You should be able to apply these example calculations your situation. The above figures are not consistent. For example, calculating the loan term. If you are paying $2,380 per month the loan should be repaid in 171 months. Not the answer you're looking for? Browse other questions tagged mortgage amortization or ask your own question. How to pay more principal on home loan? 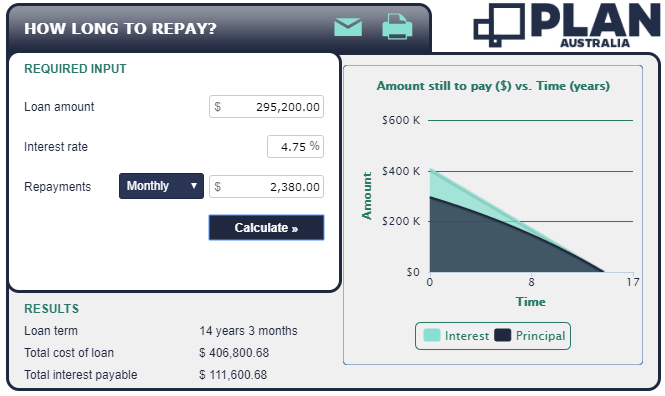 Calculating payoff date and monthly payment for a school loan? Is it beneficial for me to refinance my house at a lower rate? How to calculate payment and accrued interest on a mortgage when one payment missed (D30)?